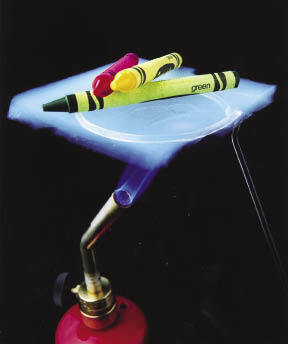 Crayons placed on top of a piece of silica aerogel will not melt from the heat of a flame. Certain types of aerogel provide 39 times more insulation than fiberglass. 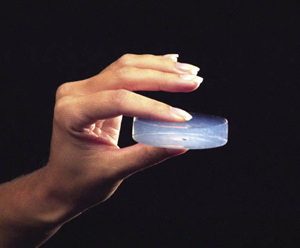 Aerogel is made from a wet gel that is dried. The substance has been described as feeling like volcanic glass pumice; a very fine, dry sponge; and extremely lightweight Styrofoam. “When you hold a piece of silica aerogel, it feels otherworldly. If you drop it on a table top, it has an acoustic ring to it. It sounds like a crystal glass hitting the table,” describes George Gould, the director of research and development at Aspen Aerogels Inc. Similar in chemical structure to glass, aerogels have gas or air in their pores instead of liquid. Developed in the United States nearly 80 years ago by a man named Samuel Stephens Kistler, an aerogel is an open-celled material that is typically comprised of more than 95 percent air. With individual pores less than 1/10,000th the diameter of a human hair, or just a few nanometers, the nanoporous nature of aerogel is what gives it the lowest thermal conductivity of any known solid. The remarkable characteristics of silica aerogel—low density, light weight, and unmatched insulating capability—attracted NASA for cryogenic insulation for space shuttle and space exploration mission applications. For example, when a shuttle is fueled, it requires more than half a million gallons of cryogenic liquid oxygen and liquid hydrogen. To remain a liquid, hydrogen must stay at a cold -253 °C and liquid oxygen must remain at -183 °C. The systems necessary to deliver, store, and transfer these cryogenic liquids call for high-performance insulation technology at all steps along the way and into space. In 1992, NASA started to pursue the development of a practical form of aerogel. Up until that point, aerogel had always been too fragile to handle in its monolithic (or solid) form, and too time-consuming and expensive to manufacture. The concept for a flexible aerogel material was introduced by James Fesmire, the senior principal investigator of the Cryogenics Test Laboratory at Kennedy Space Center. Fesmire, at that time a mechanical engineer responsible for cryogenic fueling systems design, envisioned an aerogel composite material that would be practical to use, but would still exploit the phenomenal heat-flow-stopping capability provided by the nanoporous aerogel. Aspen Systems Inc. worked with NASA to manufacture a more durable form of aerogel. The flexible material is made by filling the spaces of a fiber web with silica aerogel. Aspen Aerogels Inc. produces nearly 20 million square feet of aerogel material per year and sells it for government, industry, and consumer applications. Kennedy Space Center awarded Aspen Systems Inc., a research and development firm in Marlborough, Massachusetts, a Small Business Innovation Research (SBIR) contract to create a flexible, durable, easy-to-use form of aerogel. 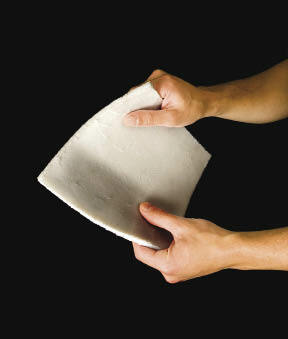 The world’s first aerogel composite blankets were produced in 1993 as cookie-sized laboratory specimens. Initial testing under cryogenic conditions showed the material to have exceptionally good insulating performance in ambient pressure environments. At that time, standard laboratory test machines were inadequate to fully characterize the material’s very low heat transfer characteristics under cryogenic conditions. A second phase of the SBIR program, a collaborative effort with Kennedy, was awarded in 1994. As part of that collaboration, a cryostat insulation test apparatus was devised for measuring the true thermal performance of the aerogel blankets. This apparatus, Cryostat-1, was able to fully test the material and later became the cornerstone capability for the laboratory at Kennedy. By 1999, these contracts led to further partnerships, and Aspen Systems developed a manufacturing process with NASA that cut production time and costs, as well as produced a new form of aerogel, a flexible aerogel blanket. To make the new material more useful, the spaces within a web of fiber reinforcement were completely filled with silica aerogel. “It’s a little like an epoxy resin in the polymer composites world. By itself, epoxy resins can make great glue. But if you combine it with fiber, you can make airplanes and helicopters out of it,” says Gould. To develop and market the revolutionary product, Aspen Systems started Aspen Aerogels Inc. in Northborough, Massachusetts. Since 2001, Aspen Aerogels has been using the same manufacturing process developed in part under the NASA SBIR to provide aerogel to the commercial world. 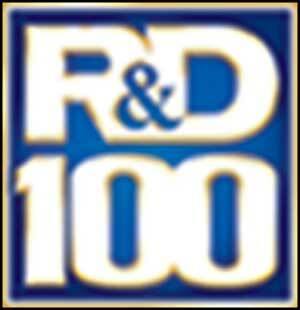 In 2003, Aspen Aerogels received the “R&D 100” award from R&D Magazine. By 2009, the company had become the leading provider of aerogel in the United States and currently produces nearly 20 million square feet of the material per year. A company called Polar Wrap LLC encapsulates the NASA-derived aerogel and uses it in a product called Toasty Feet (shown above and on the right). These insoles protect people’s feet from both heat and cold. 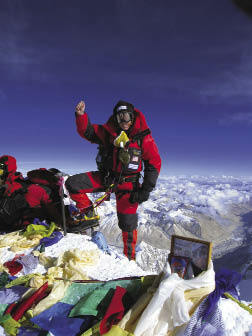 Mountaineer Ann Parmenter summitted Mt. Everest on May 25, 2006. She said her feet stayed comfortable and warm while wearing just one pair of socks—plus Toasty Feet insoles—inside her climbing boots. 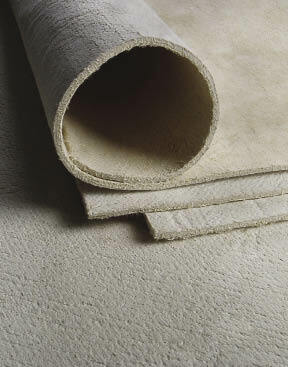 While NASA uses Aspen Aerogels’ product for cryogenic applications such as launch vehicles, space shuttle applications, life support equipment, and rocket engine test stands, there is an array of commercial industrial applications including pipe insulation, building and construction, appliances and refrigeration equipment, trucks and automobiles, as well as consumer applications, such as personal apparel. Most recently, the NASA-derived aerogel has been applied to protect and insulate people’s hands and feet. Polar Wrap LLC, is a Memphis, Tennessee, company that buys the material from Aspen Aerogels and then applies its own patented process to encapsulate the aerogel and use it in insoles called Toasty Feet. 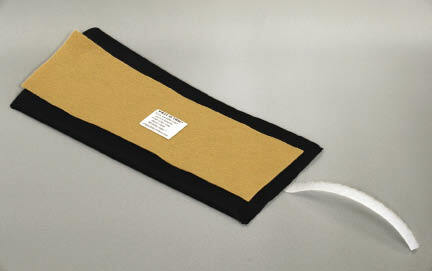 Designed to fit in the bottom of a boot or shoe, Toasty Feet resists heat loss and heat gain. According to the company, sales totaled over a million and a half pairs in 2009. 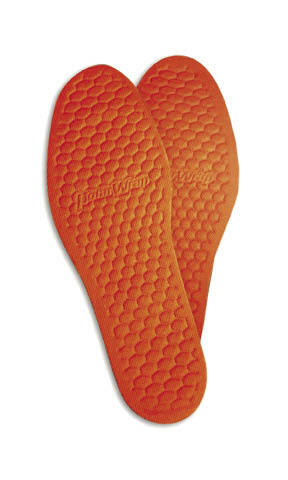 Their line of insoles includes mens, womens, youth, extra cushion, and arch support. The inventor of the process to encapsulate the aerogel for Polar Wrap was originally looking for insulation for the refrigeration system on his sailboat. When he saw the capabilities of aerogel, he thought the material held promise for the company. The inventor then devised an application for clothing, which resulted in the process now used to make Toasty Feet. The Wrist and Ankle Wraps (to the left and above) were made by Originals By Weber to help people with Raynaud’s disease fight painfully cold hands, fingers, feet, and toes. According to the company, ultra-thin aerogel insulation assists in controlling and maintaining blood temperature, and also increases blood flow to the hands and feet. According to Polar Wrap, two people walked the length of the Great Wall of China (a 4,500-kilometer walk that took 6 months) wearing Toasty Feet. A mountaineer climbed Mount Everest using Toasty Feet instead of liner socks and said her feet stayed warm. In addition, an endurance runner who ran a marathon from Death Valley to Mt. Whitney, California, said her feet stayed heat-free while wearing Toasty Feet. Another company looking for ways to warm feet—and hands—also decided to use Aspen Aerogels’ product. Originals By Weber, of Toms River, New Jersey, is an Internet-based business. The owner, Terrance L. Weber, wanted a way to help people with Raynaud’s disease, a condition that causes the fingers and toes to feel numb and cool in response to cold temperatures or stress. The smaller arteries that supply blood to the skin become narrow, limiting the blood circulation to affected areas. 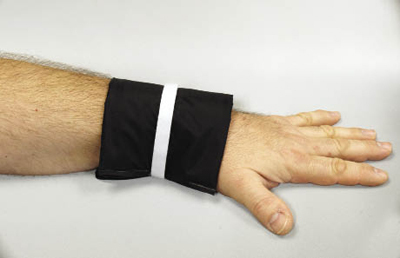 Encased in nylon, the Wrist and Ankle Wraps are secured with a strap to maintain the normal temperature of the blood as it flows from wrists to hands and fingers, and from ankles to feet and toes. In the course of 6 months, the company has sold about 75 pairs of the product. In addition to insoles, and wrist and ankle wraps, the NASA-derived product has also made its way into boots. Salomon, a French company that sells sporting products, incorporates aerogel into its Toundra winter boots for men and women. Another French company, Heckel, incorporates aerogel insulation from Aspen Aerogels in its MACPOLAR boots. The company ensures comfort in temperatures as low as -50 °C, and promotes the boots for refrigerated warehouses, oil and gas exploration, snow and ski slope services, mines, transport services, and other harsh winter conditions. Toasty Feet™ is a trademark of Polar Wrap LLC. Styrofoam™ is a trademark of The Dow Chemical Company.